Outsourcing in Romania works! Successful operations are tightly connected to the ability of the management to profitably use the available resources. Over the last decade whoever planned an outsourcing strategy to Romania registered higher share value and higher margins. 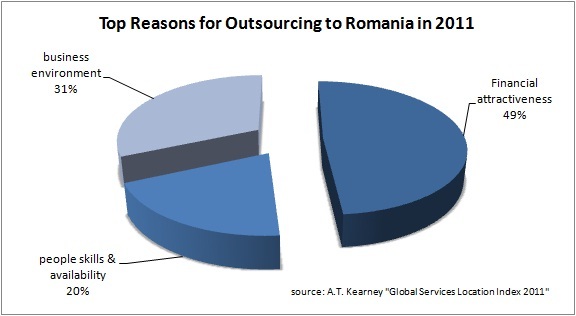 Cost savings and efficiencies led CEO’s to look for Romania as a valuable outsourcing resource. Facing an emerging market place, outsourcing customers that opted for Romania still have to cope with the inherent challenges of the new economic world map. Romania competes with neighboring CEE countries, but also with India or Russia. Hence, the outsourcing community in Romania has to break its way forward, as to offer more added value and more effectiveness. Firstly, outsourcing investors come there where they see the potential growth value. According to IMF, “World Economic Outlook Database 2009” and Eurostat, “Real GDP Growth Rate” Romania was the fastest growing market in the CEE region hitting its growth record in 2004 with 8.5% and replicating this momentum in 2006 (7.9% growth rate) and in 2008 (7.1% growth rate). Obviously 2009 was marked by the recessionist flu. However as to have a comparison against other countries, Bulgaria registered in 2009 a growth rate of 6.0% and Ukraine a rate of barely 2.1%, according to the same sources. Secondly, outsourcing activities require a healthier way of thinking and a sense of equitability and mutual respect. 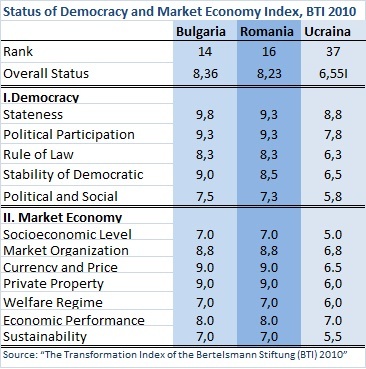 Thus we took a look to the Status of Democracy and Market Economy Index of the Bertelsmann Stiftung (BTI) 2010. 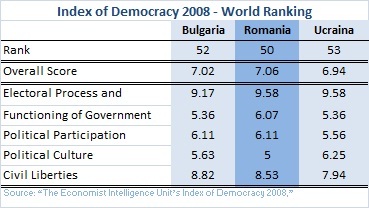 Romania is ranked 16, two ranks behind Bulgaria (ranked 14) but 21 ranks before Ukraine (ranked 37), from a group of 128 studied countries, having an overall status of 8,23 out of 10. Another relevant indicator is the Transformation Index BTI of the same Bertelsmann Stiftung that sheds light upon the political and economic status of each country as well as upon the political management performance by the relevant factors: Romania is ranked 25 having a Management Index Score of 6,27 out of ten. electoral process and pluralism; civil liberties; the functioning of government; political participation; and political culture. The five categories are inter-related and form a coherent conceptual whole. At this point, the socio-economical and political context in Romania has favored first arrivers to set up solid business relationship and seek for new arrangements. Whoever may say that Romania is an emerging market and that it is a “wild” terrain should also be acknowledged of the fact the domestic IT&C industry rapidly integrates in the global IT&C trends. From our own experience we now can warn outsourcing skeptics and promoters, that in Romania as anywhere in the world some legends about outsourcing are to be treated with a mature eye. 1) Outsourcing is a reliant and non-autonomous process. Often it is forgotten that outsourcing is part of a General Business Strategy, directly affecting business results. Therefore objectives communication must be enhanced along the decisional flow until the outsourcing provider and one outsourcing provider might very well depend another outsourcing provider working for the same customer. 2) Outsourcing draws economies of scale until a certain point. Cutting costs is real and it happens with a well managed outsourcing arrangement, if processes are standardized to the needed extent. 3) Outsourcing needs contract governance. Many naïve promoters of the idea of outsourcing implicitly assume that these contracts will be self managed. Large scale projects or very innovative projects led through outsourcing cannot meet expectations without proper governance from the sourcing company. 4) Outsourcing parties enter a working situation based on a win-win strategy. Looking at the outsourcing provider as a business opponent is wrong. In order to have all premises for success, both parties should seek mutual benefits and gains. 5) Outsourcing is not a matter of price. Beyond the price factor, services outsourced today are vital to corporate strategy, so matter of capability, culture or relationship become far more important to long-term success. 6) Outsourcing arrangements have their dynamics and evolution. The market economy first rule is to “follow the needs”. Therefore needs may change, so outsourcing services may need to adjust to them. It is not necessary to end the outsourcing contract, but to reevaluate and redesign the mutual relationship. Based on the learned lesson of outsourcing in Romania, agile managers and CEO understand now that Romania may be a new breed of software outsourcing arrangements. A different class of software engineers may be trained and shaped according to the next decade requirements. The multilingual labor pool and creative talent leveraged by the newest technology can be your most effective resource.